When you work with PHP in NetBeans, one of the most useful features of this IDE is the implementation of multiple tools like Git, SVN and other features that really boost your productivity when working on this platform. Everything in NetBeans is based on a Project level, where if you want to work on a directory, this directory must be a NetBeans project. Sources folder is already in NetBeans project (maybe only in memory). In this article, we'll explain why this happens and how to solve this issue quickly. This message appears only when you try to create a new project when the selected directory is already a NetBeans project. So if you don't want to reconfigure it, open the project instead of creating it. 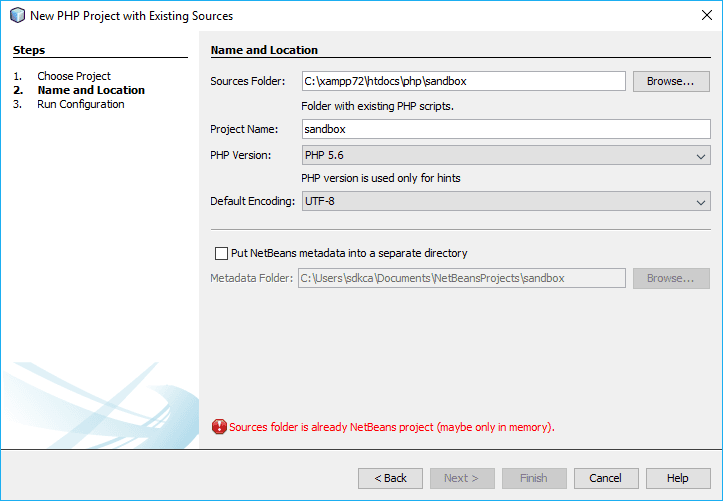 Alternatively, if you still want to create it as a new project, delete the nbproject directory of the folder that you want to work with and restart netbeans (very important, otherwise the project will be kept in memory and the message will appear again). After following those steps, you will be able to create a project normally again.